Is U-32’s Budget in Line with our Priorities? On the evening of Wednesday, January 4, the U-32 School Board sat down for their first meeting of 2017. Two and a half hours were focused on the budget proposal for the 2017-2018 school year, which is proving controversial due to cuts to teaching staff. Despite discussion over the budget, draft #4 passed with a 6-1 vote by the School Board. Class sizes were a significant factor in deciding where the budget had flexibility. “Small classes, which we generally consider those fewer than 10 students, and average class size, which probably needs to be around 18 to 22 kids for it to be monetarily and budgetarily strong,” said Dellinger-Pate. In the end, the school cut three teaching positions: one in art, one in design and tech, and one in science. U-32’s newly approved budget summary. Laure Angel, a social studies teacher in the middle school, was surprised by the low turnout from teachers and the community, especially since substantial cuts were proposed. While the attendance of the meeting was low, the discussion pointed to a troubling question: does the new budget support the change to proficiencies? Angel expressed concerns over position cuts due to the commonly held belief that proficiencies will ultimately require more staff. “It doesn’t take less hands on deck. If we’re going to have a school where a lot more advising is done, that’s a different kind of work than direct instruction to a classroom. It takes a lot of time,” explained Angel. 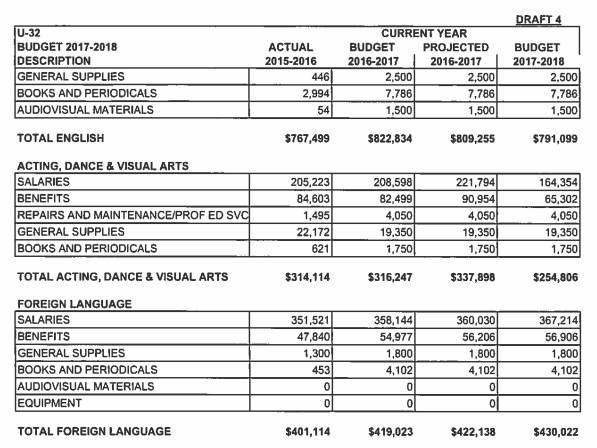 But the stark fiscal realities the school faces may cut against the five year vision. From 2006-2016, the number of students enrolled at U-32 has decreased by 104. At the same time, we will see significant increases in the costs of transportation, special education, and salaries.